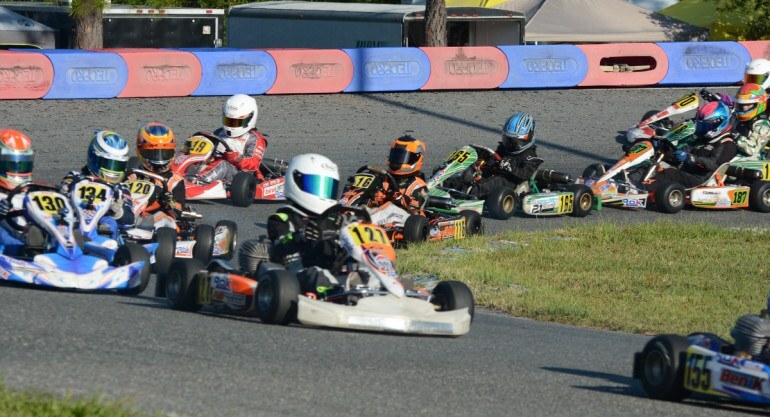 August 18, 2015, Jacksonville, Florida — Another successful event is in the books for ROK Cup USA as it hosted Round 4 at the 103rd Street Track in Jacksonville, Florida on August 15th and 16th. The event saw both some old favorites and new faces walk away with victories as the series heads into its final round next month. Shifter ROK and Shifter Master ROK had some strong contenders in the field, but in the end it was A.J. Myers and Jeffrey Neubert who came out victorious in a very wet final that saw some major action on the track. This was Myer’s first ROK Cup USA race for the season, and he definitely proved to be a contender all weekend. Kyle Kirkwood was also out in front in the Shifter ROK class, representing OGP with a 2nd place finish, while Ben Hankinson took 3rd. In Shifter Master ROK, Neubert, who was onboard a PCR chassis, had some issues throughout the weekend in the heats, but took to the track hard in the wet conditions and pulled off an impressive win in the final. Finishing 2nd was Tom Hankinson and rounding out the top 3 was Patrick Madser. 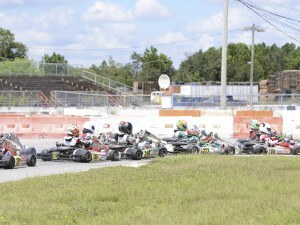 Senior ROK had a stacked field that included drivers from OGP, Team Felon, and PCR. As predicted, Norberg was one to watch, delivering a stellar performance as he was consistently up front all weekend and conquered the top step of the podium in the final. Dustin Stross of Team Felon was just behind him in 2nd and OGP driver Kirkwood, who doubled up and ran both the Senior ROK and Shifter ROK, ended up in 3rd. Master ROK had a excellent turnout as well, and it was Gonzalo Aponte who walked away with the win in the final, while U.D. Ramsey took 2nd and Miguel Gransaull ended up with a 3rd place finish. In Junior ROK, Piquet Sports driver Pedro Goulart made a strong impression on the field as he proved to be fierce competition throughout the weekend, ending with a 1st place finish in the final. Anthony Gangi, who is currently the points leader for the championship, ended up taking 2nd place and Zachary Hollingshead finished in 3rd. Micro ROK saw Team Benik driver James Egozi and Team Felon driver Jeremy Fletcher secure their frontrunner statuses, battling it out throughout the weekend. In the end, Egozi took the top spot, with Fletcher finishing in 2nd and V Motorsports driver Santi Trisini placing 3rd. In Mini ROK, Lachlan Defrancesco walked away with the win, Reece Gold finished in 2nd and Tyler Maxson ended in 3rd place. Championship points will be posted this week, and with only one race to go we are close to knowing who the lucky drivers are that will be traveling to Italy in October for the International ROK Cup Final. The final round of ROK Cup USA will take place September 19-20 2015 in Orlando, Florida, and registration for the event opens this week. 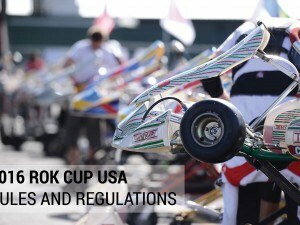 You can follow ROK Cup USA on Facebook, Instagram, and Twitter @ROKCupUSA. 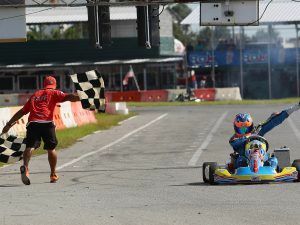 PHOTO CAPTION: Piquet Sports driver Andre Goulart proved to be a top competitor in the Junior ROK class, taking home the top spot in Sunday’s final.